I feared the worst, but I am glad that I was wrong. 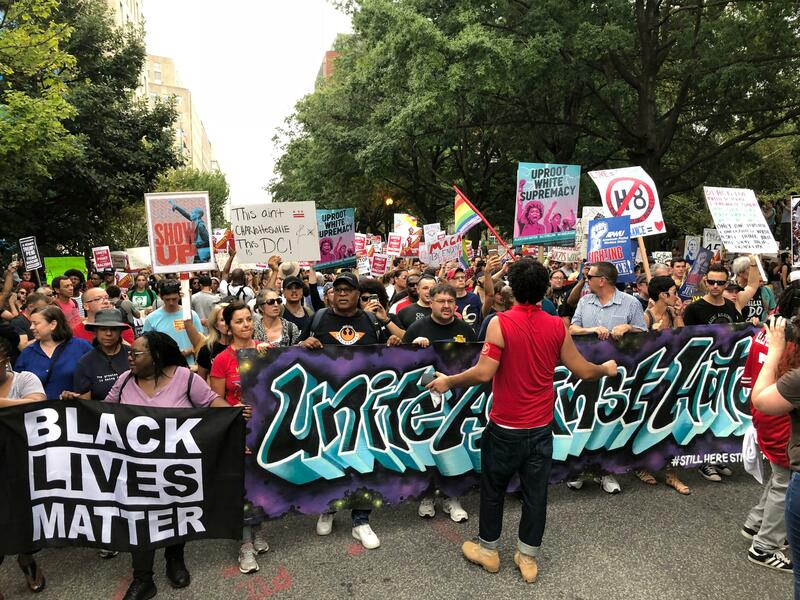 Jason Kessler’s Unite the Right 2 rally outside the White House on Sunday, August 12th, was a triumph. It was still a highly risky, even foolhardy venture, and I would not have done it. But luckily, it ended up being good for white identity politics. But wait a second. Only about 25 to 30 people took part in the protest, yet there were thousands of screaming counter-protesters on hand. How is that a triumph? Because such events are not, primarily, battles between the people who show up. Rather, they are battles for the public mind. And Unite the Right 2 offered some highly edifying contrasts, which we should publicize as best we can through alternative and social media. The Unite the Right 2 marchers were peaceful and mostly presentable. The counter-protesters were a rabble of violent freaks who assaulted police and journalists. The Unite the Right 2 message was eminently reasonable: a protest of the unjust treatment of Unite the Right 1 by the Charlottesville and Virgina state governments and the international lying media. The counter-protesters, however, were mostly Communists and other extreme Leftists, whose chant “No borders, no wall, no USA at all” is an open declaration of war on the very existence of America. Their small numbers also worked in Unite the Right 2’s favor, in three ways. First, at last year’s rally, the violence was entirely the fault of the Leftist mob, which the Charlottesville police allowed to attack the marchers. But the large number of marchers made it easy for the lying press to claim that the violence was started by Unite the Right. At Unite the Right 2, the police did their jobs, and the vast disparity of numbers made it clear that the purpose of the police was to protect Unite the Right from a raving Leftist mob. Second, if a large crowd had showed up at UTR2, the coverage would have been entirely on them. Instead, a surprising amount of the coverage was focused on the counter-protesters, which is highly enlightening for normies. Third, the fact that only a couple dozen people had to assemble to create this level of Leftist mobilization and press coverage means that Unite the Right 2 achieved maximum propaganda impact for surprisingly little money and risk. Moreover, the Left and the system as a whole spent enormous amounts of money to assemble a vast throng of violent and repulsive misfits and broadcast them to the American public. At Unite the Right 1, the Alt Right defeated itself at great expense. At Unite the Right 2, Kessler triggered the Left — both the mob and the media — into defeating itself at great expense. That’s a huge improvement in tactics. Cynics are claiming that half of Kessler’s protesters were probably undercover law enforcement and Left-wing infiltrators. If so, that is great. First, it does not change the propaganda victory for us one iota. Second, it actually lowers the costs and risks even further. I would rather enemy agents risk getting beaten or killed by antifa than legitimate white advocates. After the first Unite the Right, someone suggested that the best possible outcome would have been to have done the torchlight march on Friday, then simply cleared out of town and allowed the Leftist mob to riot in front of the assembled cameras the following day. Basically: trigger the Left into a violent televised tantrum. Unite the Right 2 came close to doing just that. The story of Unite the Right 1 focused on the “evil white supremacists.” The story of Unite the Right 2 focused mostly on Left-wing extremists. That is a victory for us. Jason Kessler also handled himself impressively in interviews, red-pilling normies and triggering Leftists  into edifying meltdowns. A couple months ago, Jason and I had a conversation about Unite the Right 2. He explained that he wanted to separate himself from the Alt Right and try to build a Gandhian non-violent White Civil Rights Movement. I encouraged him in this idea but tried to dissuade him from the march altogether. But he’s a principled and stubborn guy. I am sure Jason feels on some level that the Unite the Right 2 failed, because so many of the people who showed up last year decided to pass. Frankly, though, that’s what made it a success. Unite the Right was a disaster. So repeating Unite the Right was obviously a bad idea. 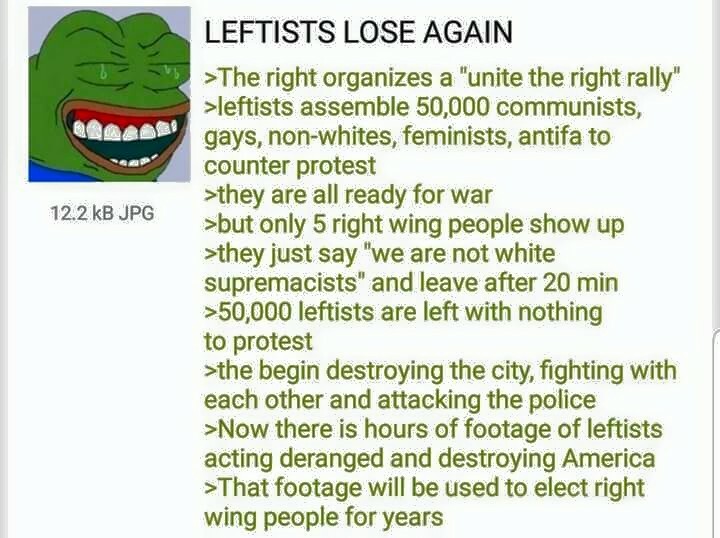 But when the Alt Right did not show, Unite the Right 2 was no longer a repeat of a bad protest. It became something entirely different. It actually became something good. There may be strength in numbers, but the true strength of UTR2 was in its lack of numbers. We are a tiny minority anyway. Why not find a way to make that work in our favor? 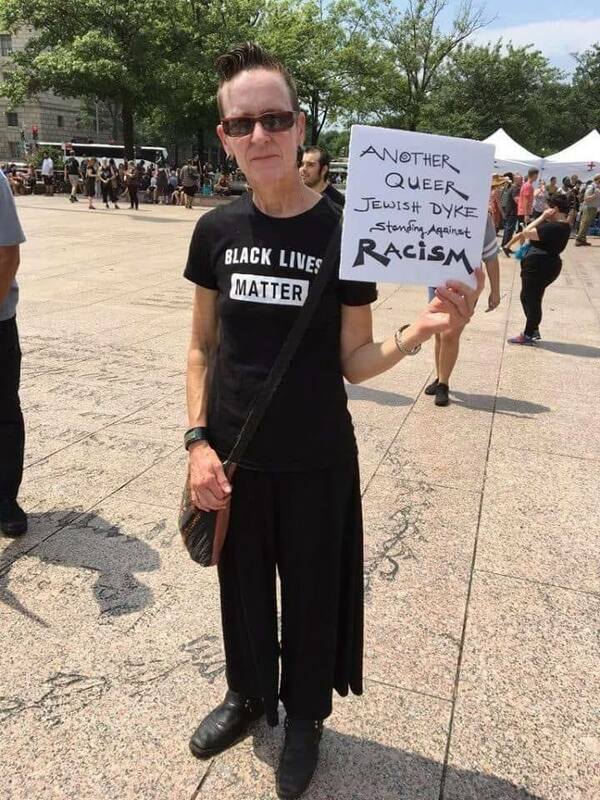 In fact, I would like to see more white advocates forming groups that are intentionally small — say no more than 20 people — but highly selective and disciplined, with balls of steel, to do events like this all around the country, especially in Left-wing strongholds, to goad the Left into further discrediting themselves. Americans are increasingly coming to the conclusion that we simply cannot allow the Left to get back into power, elections or no elections. Anything we can do to spread and harden this consensus is a good thing. After the first Unite the Right, my friend Cooper Ward argued that the fact that the Alt Right stayed away from the Berkeley event the following weekend worked in our favor, because the only thing the press had to focus on was violent communists attacking boomers in MAGA hats. If Richard Spencer or Christopher Cantwell had showed up at Unite the Right 2, the coverage would have been about them, and the most valuable lessons would have been lost. So the fact that the Alt Right boycotted Unite the Right 2 was a gift to Jason Kessler. He didn’t need the Alt Right. In fact, he needed a clean break from them. Now that he has it, I hope that Jason will take his tiny cadre of supporters and build the White Civil Rights Movement he envisions. There is a growing consensus that the Alt Right is dead, killed by adopting the self-marginalizing ideas and ethos of White Nationalism 1.0. The Alt Lite, moreover, is absolutely opposed to white identity politics. So there’s a need for fresh new approaches to white advocacy. I wish Jason every success.